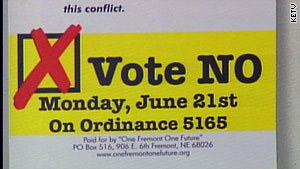 An anti-ordinance signs appears in Fremont, Nebraska. (CNN) -- Voters in Fremont, Nebraska, are deciding on Monday the fate of a measure making national headlines and stirring up the continuing debate on immigration. Ordinance 5165 would, if approved, prohibit businesses from hiring illegal immigrants and halt landlords from renting to them. The issue has divided the city. Fremont officials told CNN affiliate KETV in Omaha that they have plans in place that involve cuts in city services and tax increases to pay for legal fees associated with the passing of the ordinance. But even if that ordinance passes, experience shows that it will likely be struck down and face years of legal battles. The American Civil Liberties Union has indicated it will file a lawsuit. The reason according to Marsh: Both laws violated the U.S. Constitution's Supremacy clause and the 14th Amendment. In addition, she said it's the federal government's responsibility to set immigration policy and "we are not well-served when communities or states try to set policy on their own." One state did just that, setting off a firestorm across the country. Arizona Gov. Jan Brewer recently signed a bill into law that allows police to ask for proof of legal residency when investigating a suspected crime. The Obama administration, according to a senior administration official, is planning to file a legal challenge to the law within the month. Critics say the Arizona law will lead to racial profiling and prevent police from doing their jobs by undermining trust in the Latino community. City governments and organizations opposed to the law have targeted Arizona with protests and boycotts. Phoenix Mayor Phil Gordon said there have been some economic effects because of the boycotts, adding that the nationwide debate doesn't help business in his city. Gordon, an outspoken critic of the new law, has turned his attention to calling on Congress to pass comprehensive immigration reform. It's the lack of such legislation, he said, that is leading cities and states to develop their own immigration laws. "It is still like putting out a fire but not moving the gasoline truck that fell over," the Democratic mayor said. "You've got to get comprehensive immigration reform through Congress." Until then, some cities are working on immigration programs. "I know in other communities, some we work with, they are doing immigrant reform -- working them into the communities and working on ways to get them citizenship and working with them at building trust," Minchak said of those who are in the United States legally.